Discussion in 'Handy Tools & Equipment' started by mborg10, Jan 5, 2014. Has anyone had anyone experience with this soldering iron. Can the hot air gun part be used on heat shrink. It looks like it can in the description but does anyone know if it's any good. Yes not a problem at all, Theyre actually the best thing for heat shrink as not only can you vary the temp but you can also vary the fan speed. Andt if you want to dabble in some SMD soldering you got the perfect tool as well. Ok cool. Ill book it in for my birthday present. I got a multimeter and some tools for my Christmas present from the wife. I get to borrow her heatgun she uses for craft for the heatshrink. Yes i has but 2 years before. That experience was just good enough. are these as good as the 910$ ones that they are a copy of???? 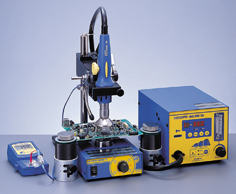 That is the soldering station that I have & absolutely love it. are these as good as the 910$ ones that they are a copy of? ??? I would guess they are the same unit, the $910 ones have probably been re-branded to add an extra $800 or so. I intend to get one of these later in the year when I'm able to scrape some pennies together. The cheap copies are almost always pretty bad to use compared to the real deal. That's not to say that you may not get usable results (for your purpose) with them. A $900 station is not going to be the same as sub $100 one. Not a simple re-brand by any stretch of the imagination. hey guys, when I saw the $900 I freaked no way I would pay that, its what they do on ebay when the are either out of stock or almost out so the listing can carry on, well that's what I have been told, and the brand doesn't look like a $900 brand. A nice iron is the Hakko FX888 (we have a few at work) although I believe you can only buy the FX888D (digital controls) version now. They are in the $200 range. If you see one significantly cheaper, it will be one of the crappy clones. A good soldering iron can make a huge difference, just as using 63/37 leaded solder will (0.71mm is a good size). Forget lead-free solder. You don't want it and will only cause you grief.